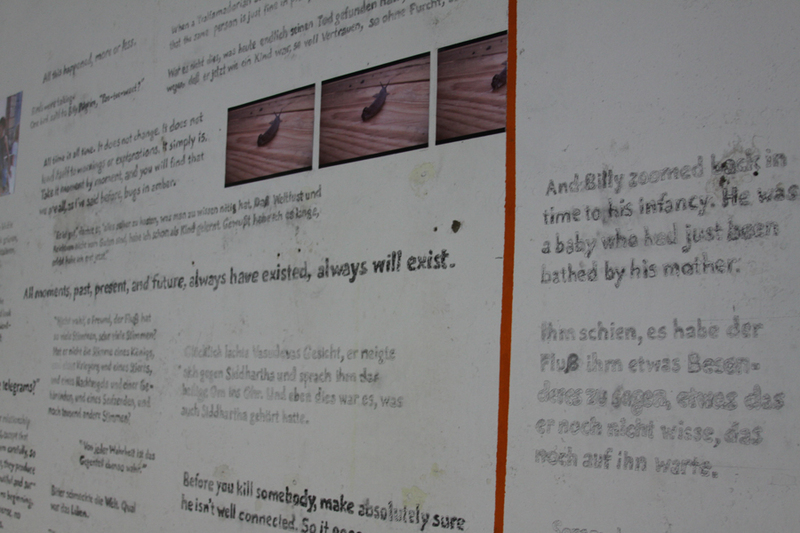 Text on the wall is a narrative consisted of quotations from two novels; Siddhartha by Hermann Hesse and Slaughterhouse Five by Kurt Vonnegut. 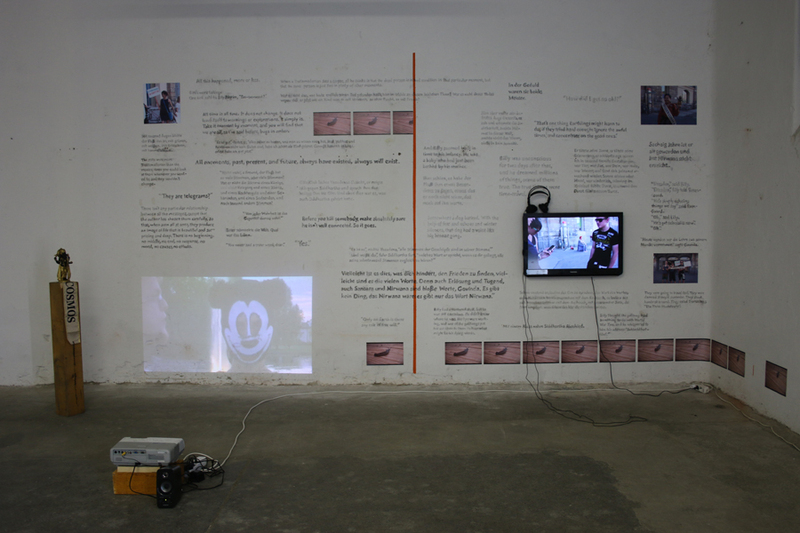 In this work I used the same staging methods as L’espace – quoting as a performative act – and both works which are based on a performative process can be considered as site specific. The place where this wall is located was once an old slaughterhouse in Dresden, now an art space / exhibition area called Ostrale. 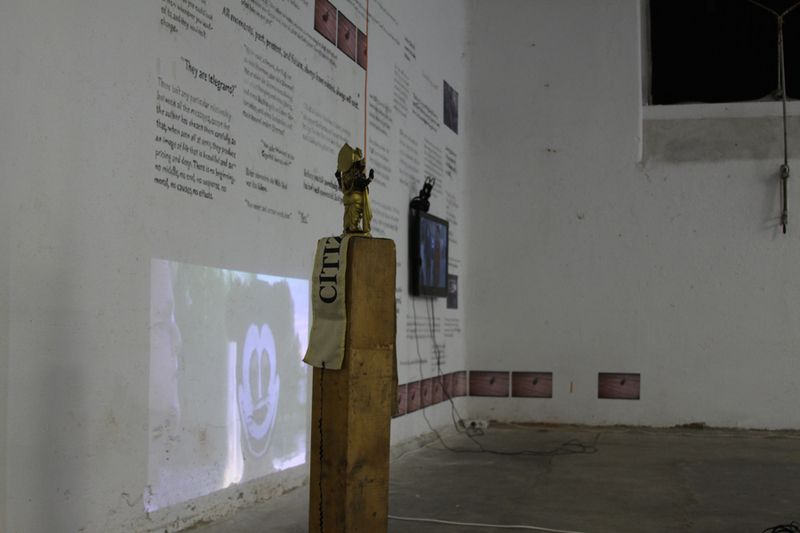 I produced this work during my stay at the Ostrale residency and at the end of one month stay, exhibited there. Ostrale exhibition area consisted of several rooms and the room I showed my work was “number 5”, which has a strong connection to Kurt Vonnegut’s novel Slaughterhouse – Five. (Dresden was bombed in the World War 2, Vonnegut’s character Billy, who was “unstuck in time”, escaped the bombing there, in that slaughterhouse.) Besides that, during my residency I was staying in a very small wooden house, living a daily life which has something in common to Hermann Hesse’s Siddhartha: regularly meditating, practicing yoga, taking notes of day and night, writing dream diaries, tasting the nature outside and my own nature inside. I also made a series of performances in the city with people waiting in front of the train stations: “Citizen Cosmos Om Competition”. Within all this process I started to play with narrative connections of notions like past/present/future and fiction/documentation in order to find a zone in-between, beyond representation.